This is the Good Mixer in Camden Town. 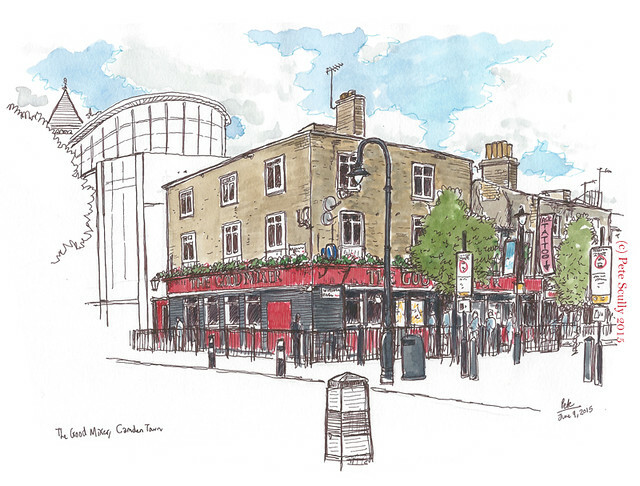 I was meeting up with my friend Simon, and while he dealt with the fun that is London Transport I came down here to sketch this old pub from the outside. It was pretty chilly, which I was not displeased with (writing as I do after several 100 degree-plus days here in Davis), but I just had to capture this old Camden warhorse. One day I will draw the unchanging interior; that place has stories to tell. The Mixer is well-known in Camden, in the 90s it was the haunt of many Britpop locals, and when I used to come out in Camden this would invariably be the place where we would end up. My mate Terry and here spent many Saturday nights in here playing pool (well actually he wad the one playing pool, I would usually lose a game then watch), met many interesting characters, saw the odd ruck, drank a lot of beer and cider. I still have a nice orange scarf that was left in here one night in the early 2000s; a woman (I think she was French) who was sat next to us had left it behind, so I held onto it until she came back. When she didn’t, I handed it to the barstaff at closing time, but they said they would just throw it away, so I should keep hold of it. It was a nice scarf, and a cold night waiting for the N5. Fun place, the Mixer. For years I didn’t realize the bar had two sides, I had assumed that it was a mirror behind the bar, but a mirror that didn’t work very well reflecting people (this gives a good idea as to the time of night we would usually end up in here). Lots of fuzzy memories. Admittedly my stories are not anywhere near as colourful as some of those who pass through here, but I’m not that interesting a person. Anyway, I finished up my sketch, and popped in for a beer (by the way London, wow, how can you charge so much for pint? It’s almost double what it cost when I last lived in London! ), and added the colour while waiting for my mate to arrive, and we went to the Spreadeagle. Beautiful sketch. Love the description of the broken mirror – clasic late night thinking. Honestly, for years I didn’t realise. It was like the Bar at the Folies Bergeres, except it was the Mixer in Camden.